When you buy our Hot tubs and Saunas since 21.03 till 21.04.2019, you get a 10% discount on all our products*+ GIFT. To get a 10% discount you need to apply/inform the promo code EASTER19 during the checkout. *This promotion extends only to private persons. During the campaign you can use ONLY 1 PROMO CODE. The promotion does not apply to the sale category . This promotion also does not apply to the grill-houses category . It would be particularly pleased to get the photo of your Hot tub or Sauna after installation and to see a review about us on Google, Trustpilot or Facebook! Make a present for you and your family members, buying any Hot Tub or Sauna at super attractive offer from Baltresto! 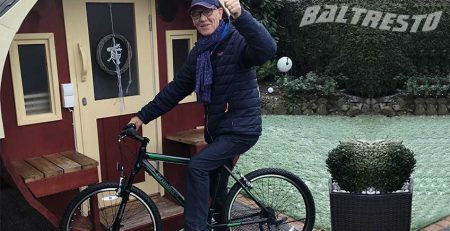 Our happy customer who had bought Baltresto barrel sauna with a hot tub and won a bicycle!